Childcare can seem like a minefield, right? For many parents, finding the right childcare centre stirs up a range of emotions. After all, you are leaving the most precious person in your life in the hands of a stranger. But it doesn’t have to be that way. Childcare can be a special place that nurtures and enhances the development of children. It can be an environment for learning, development and growth through play and socialisation with others. A home away from home, so picking the right childcare service forms an important part of parents lives. Before you begin your search for the right childcare centre, ask yourself why you are looking for care in the first place. This will help guide you to the right type of service. The type of care may differ depending on your overall objective. For example, if you are looking for someone to look after your child for an hour or two whilst you run errands, long day care may not be the most appropriate service, and family, friends, a babysitter or perhaps an occasional care centre may be the best option. On the other hand, if you are looking to provide early education for your kids, then a long day care or a quality family day care service may be a better option. Once you know what type of care best suits your needs, then it’s time to find the perfect childcare centre. Here are some tips for what to consider when choosing the right centre for your child. which has received huge amounts of backlash. And rightfully so! Childcare offers not only care for kids, but quality early learning programs and education with many offering a specific education philosophy such as Montessori or Reggio Emilia inspired programs. Whichever it is, consider what is right for your child and your family and more specifically, does the centres’ philosophy align with your parenting beliefs? With ever demanding work and life schedules, consider the location of the childcare centre that is convenient for you. Is the centre close to home or work? How does this affect your morning or afternoon routine? Will you be able to get to the centre in time to pick up your child? As trivial as the last point may seem, it’s important to consider this as many services charge hefty penalties for late pick-ups. Childcare availability can be an issue and in order to get into a specific centre that you had your heart set on requires early planning. We’ve heard of centres that have very long waiting lists of up to 3 years, so leaving your search to the last minute and expecting that a spot will be made available for you, will leave you frustrated and disappointed. We highly recommend registering your details with your preferred childcare centre as early as possible. Placing your child on multiple waiting lists can become an expensive exercise, as some services charge an administration fee to do this, so be sure to keep this in mind. Also, ask if the fee is refundable if you enrol your child at that centre. There are a few online resources where you can check for childcare vacancies, emptyspot.com.au being one of them. You can easily see which centre has a permanent or a casual spot available and compare the centres and their services. If you can’t find a permanent spot at a centre of your choice, don’t despair, some centres offer casual childcare when one of their existing families is away or their child is not going attend on a particular day. Childcare costs can take a big portion of household expendable income, so it is no surprise that careful consideration of the costs is needed. Costs can vary significantly between services and locations. Lowest fee isn’t always the cheapest, nor is the most expensive always the best. You have to balance the fee for the service the childcare centre delivers and if you are happy with the centre overall. Also, consider what inclusions form part of the daily fee, as costs can easily blow out if you need to supply your own food, nappies etc. Don’t forget that the Government subsidises childcare. Whilst many argue that it doesn’t cover anywhere near enough of the childcare expenses, any form of subsidy can go a long way. Do you know what rebates you are entitled to? Are there any additional or hidden fees? We prepared a concise overview of the new Child Care Subsidy – The New Child Care Subsidy – An Overview for Parents. Contact the centre as they should be able to help you calculate the level of assistance you may be able to receive. Alternatively, contact Centrelink for assistance. As busy parents, flexibility is key. Not only to accommodate work schedules (permanent, casual or shift work) but also unexpected personal commitments. It’s worthwhile considering if the childcare centre allows flexibility with the days of care that you have booked for your child. Does the childcare centre allow you to change your days and are there any penalty fees in doing so? Do they offer additional casual spots over and above the permanent days that you have already booked? What systems are in place to make this process easy? Platforms such as emptyspot.com.au make access to flexible childcare easier for parents by allowing them to book a spot when the need arises, even after hours. The National Quality Framework stipulates that childcare services must be registered. We strongly recommend you only use a licenced and registered childcare service in your state. You can check if the centre is registered on the ACECQA website or by doing a search on the emptyspot.com.au website. Emptyspot.com.au ONLY lists registered services. Each centre is rated against a set of standards known as the National Quality Standards and it is a requirement that the rating is displayed publicly. It is a vigorous assessment process that rates each service across 7 quality areas, all specifically developed to act as a benchmark for quality education and care of services. We recommend that you check the childcare centre’s rating by asking the centre directly, or alternatively, check the ACECQA website. Childcare services come in all shapes and sizes. Family Day Care services cater for small groups of children at the carers home, whilst long day care centres can vary significantly from 20 kids to 200+. Whichever centre you consider, make sure the centre is equipped to handle the level of children under their care. National Quality Framework stipulates certain requirements for centres depending on the number of places at the centre, however as a parent, you need to feel comfortable with the type and level of care that will be provided. We have seen some large 200+ place centres that are treated as mini schools with some amazing facilities, educators, systems and procedures to cater for a large number of children. On the other hand, some smaller 30-40 place centres offer a really focussed and homely feel that may not be replicated in larger centres. Our recommendation is to go and check them out. See how you feel and how your child adapts to each type of centre. Sometimes your child will get a vibe that will tell you if they’re comfortable there or not. It may seem like it’s simple and straightforward, but cleanliness can play an important part in choosing the right childcare centre. How does the childcare centre present? Is it clean and fresh or dirty, tired and run down? What are the hygiene procedures like? Are the staff nicely groomed and well presented? Childcare is meant to be a place of happiness and joy whilst creating a learning environment to nurture and develop our children. What’s the vibe like in the childcare centre? Do the kids seem happy? How do they interact with other children and staff? Do you get a good feeling from the centre and does it feel inviting? The required number of staff that care for children is governed by the National Quality Framework and associated legislation, with specific guidelines associated with each state. We suggest that you familiarise yourself with the requirements and make sure that you are happy with the number of staff that care for your child. Some childcare centres go above and beyond the minimum requirements not only in staff ratios, but also the level of qualifications held by each educator, so it’s worthwhile discussing this with the centre director. How many educators will look after your child? What is the centre staff turnover like? Is the staffing roster consistent? And don’t forget to ask to meet the educators that will look after your little one. It’s important that the childcare centre provides a healthy, well-balanced and nutritious food menu for your children. We suggest that you get a few sample menus from the centre and make sure you are happy with the meal options provided. Kids can be fussy eaters, so check what flexibility the centre has in relation to this. Some centres will allow you to bring in your own snacks for your little ones, whereas others have strict policies on what can and cannot be brought in. Also, if your child has special dietary requirements, be sure to let the centre know well in advance and ask how they will cater for your child’s needs. Leaving your child in someone else’s care can be nerve-wracking and you may want to know exactly what your child is doing throughout the day. From feeding times, to education and play, keeping abreast with your child’s development is important, so consider how the centre communicates this with you. How friendly and professional are the staff? At the end of the day, they will be caring for your child, so you need to make sure that you are comfortable with them. We have met some amazing staff that are kind, warm, welcoming, open and honest, who essentially become part of the family, so be sure to meet the educators at the childcare centre. How is the information shared between educators and parents? What tools are used to communicate your child’s progress at the centre? How often is this communicated? What feedback are you able to provide and how is this incorporated into the development of your child’s learning? Parents talk! And when it comes to childcare, many will share their experiences with others. This can be valuable, however it shouldn’t be solely relied upon. What is important to you may not be important to others and experiences and expectations will differ. 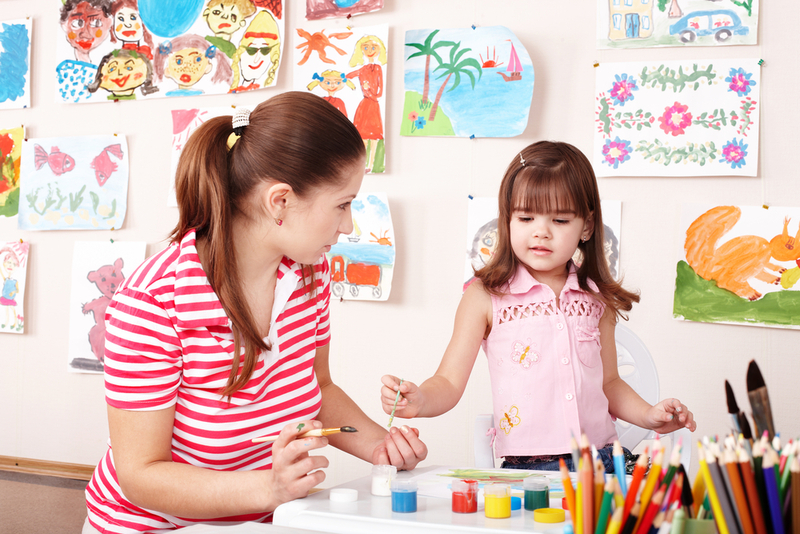 Kids also adjust to certain centres differently so bear this in mind when choosing your childcare centre. Consider reviews and testimonials, but ultimately visit the centre and make your mind up for yourself. Childcare centres have come a long way over the last decade with some incredible facilities opening. From architecturally designed buildings, rooms and play areas, to play equipment that makes the inner child in us want to come out and play. But having an architecturally designed childcare centre doesn’t necessarily make it the best. There are many other smaller or older centres that have fantastic facilities with a clever design to incorporate learning, exploration and play. The important thing is to consider how the facilities support the education and care for your little ones and whether they create a fun and safe environment. What are the physical facilities like? Are the play spaces big enough? Are there enough toys and play areas for the number of children? Is the environment safe for children to play and explore? Ultimately trust your gut feeling. It doesn’t matter how amazing the centre is or how great the staff are, or if they have availabilities or the cost is low. Trust your instinct, and if your gut tells you to keep looking, then do just that. Do your research. Check out a number of childcare centres before making your final decision. Go online, compare the centres, call them and speak with a director. Read parent reviews and shortlist a few that you are interested in and physically visit them. Some may even let you trial them for a day or two. Begin your search by visiting emptyspot.com.au to see a range of childcare centres in your area, compare the services and book a tour. It’s a free website, to help you find a spot at a childcare centre near you. Found this useful? Feel free to share with others and if you have any other suggestions or tips, please comment below. I agree that you need to consider the location of a daycare when you are choosing one. It would be good to find one that is close to either your work or home. My brother needs a daycare for his kids, so he’ll have to find one that is close by. I liked that you mention how you should take into account what type of education and philosophy will be taught at the child care center. My sister is looking for a care center and wants her kids to gain something from it and learn. I’ll be sure to talk to her about that benefit and encourage her to find a professional service. Thanks for the suggestion that we ask to get some sample menus from the childcare center or possibly ask if we can bring in snacks for our kid. Since I’ve just gotten a new job, I am looking for a great program that my daughter can attend for the first half of the day and we’re wondering how we should find the best center for her. So I will definitely take your advice to make sure that the child care programs we consider all have a delicious and healthy menu for our kids to eat from. The staff ratio really is something that you need to be looking at when you choose a childcare center for your little one. After all, you’ll want to make sure that there are enough teachers that your child will be able to get help if they need it. Of course, you also want to make sure that these teachers are well trained to educate children and provide them with a source of care. Absolutely Callum. I couldn’t agree more. I just wanted to thank you for going over some things to think about when looking for a childcare center. I’m glad that you mentioned to find a place that is flexible, especially to accommodate work schedules. It definitely sounds like this is something that is at least worth asking, so that you can be more aware of what their policies are like. Thanks Taylor. I appreciate your feedback. It’s definitely worth asking as this is a growing demand from parents to have flexibility with care whilst many centres haven’t offered this service previously. We are finding that this is changing across some centres. Thank you for your feedback and tips. I definitely agree with you! Doing a tour of a centre first and talking about your needs with the staff are so important as it will often give you a feel for what the centre is like at a core level, not just the surface. Thanks for your input. What about mentioning preschools in the types of care available. Preschools generally operate school terms and shorter hours than long day care. Childcare rebate/benefit are not available but fees are a lot cheaper. Preschools generally have long term staff, and provide consistency with the same teachers and educators and the same children in the same class for the entire year. Staff get to know the children well, children are more settled because they know what teachers, and what children will be there on the days they attend. Children attending preschools usually go to local schools together, and friendships are formed between parents and between children which also helps with the transition to school. There is a greater sense of community in a preschool too. Great advice and completely agree that Preschools are another great option for parents to consider. I appreciate your input. I agree that you want to find a daycare that is clean. It would be smart to consider taking a tour of the facilities to figure this out. I’m looking for a daycare for my son while I’m at work, so I’ll have to consider if they are clean or not. My sister is going back to work after having a baby and is looking for a daycare center. This is her first kid, so she’s very nervous about leaving her baby with strangers and has a lot of questions. I appreciate this article telling us what we should be looking for, especially flexibility; as a single, working mom, my sister may need a daycare center that allows her to change her schedule without penalty fees. Thanks for mentioning how a child care center should actually be clean. I also like how you said that your child should enjoy going there. My husband and I are looking into child care centers; thanks for your post. I really appreciate your tip to take extra time to look at the snacks that the kids are fed if your child has an allergy. My wife and I are trying to find a daycare to take our son when she goes back to work, and he has a very serious allergy to peanuts. I will be sure to do my research and check any potential daycares for the types of snacks that they serve. My daughter is going to need to go into a childcare center while I’m at work and I want to find the best one for her. Thank you for suggesting that I should make sure and find one in a location that is convenient for me. I’ll have to do some research and find the best child care center in my area. Thanks for that warning about late pick-up fees. I didn’t know that some childcare centers had those! It makes a lot of sense to have them though. It encourages people to really plan out which daycare works best for them and their kids.